This review was initially written by me for the Polymer Clay Smooshers ArtFire Guild blog. 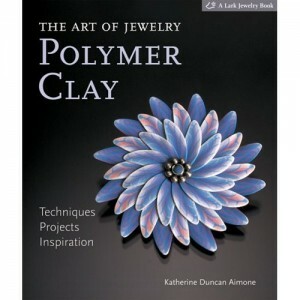 The Art of Jewelry: Polymer Clay by Katherine Duncan Aimone. 152 pages, soft cover, full color. It is a wonderful book for intermediate to advanced clayers. I do not recommend this book to beginners. The projects in the book contain just a few illustrations each, and in most cases steps are not described in full, since, being an advanced clayer, you are supposed to know how to do elementary things. I have heard some negative reviews about this book, and they mostly came from beginners, which is understandable. If you are just starting your journey into the wonderful world of polymer clay, you may become disappointed and overwhelmed by this book and may be better off with simpler projects at first, reserving this one for the time when your skills will reach the next level. However, if you are an intermediate to advanced polymer artist, this book would be a sheer delight to you, as you would have a chance to challenge yourself while using well-familiar techniques and learning new ones. Following the instructions in the book, you would truly be making art jewelry, of quality and beauty such as to be easily displayed in an art museum. – and 3 earring projects. 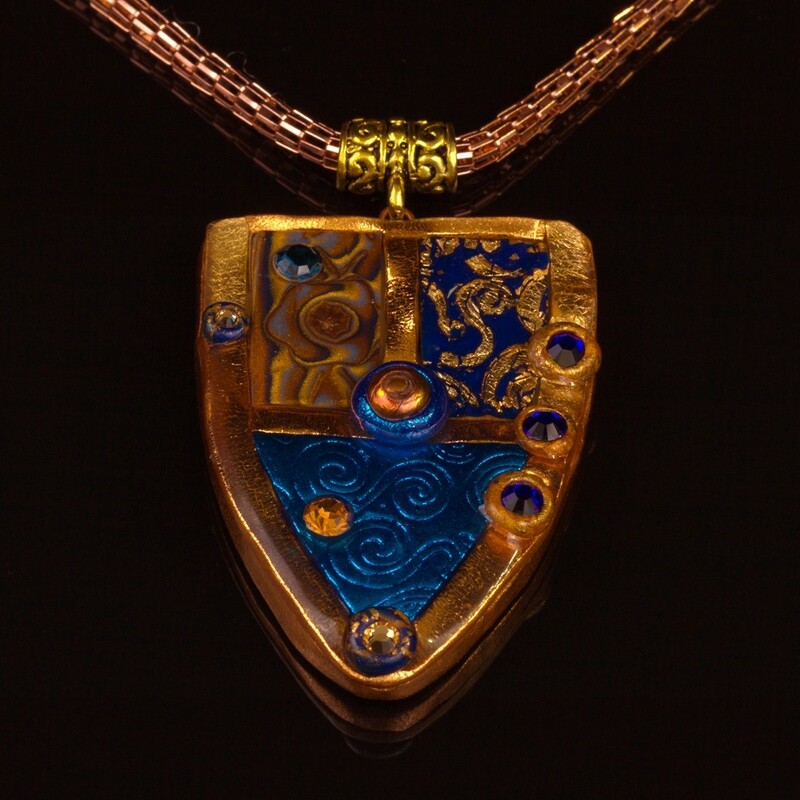 Some of the projects require use of general metalsmithing skills, such as soldering, wire work and riveting. – use of findings in polymer jewelry, including excellent instructions on attaching a pin back to polymer brooches. – Wendy Wallin Malinow (2 projects). The beautiful cover piece, Snow Flower Brooch by Sandra McCaw, is included in the book and is an advanced caning project. Book contains a lot of useful tips. 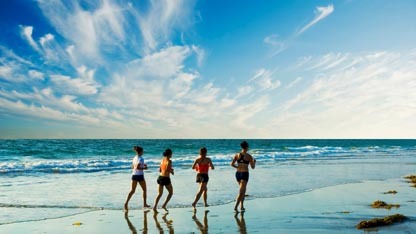 There is a wonderful inspiring Gallery section which alone makes book to be worth its price. You can learn things by just looking at these beautiful high quality photographs. Pieces presented in the Gallery are advanced to ultra advanced. At the end of the book you can find short bios of the artists whose projects are featured, alone with their contact information. And like all of that already was not enough, the book also contains a metric conversion (inches to centimeters) chart. I got my book on Amazon.com for $12.76 and, since my husband is a Prime member, shipping was free. 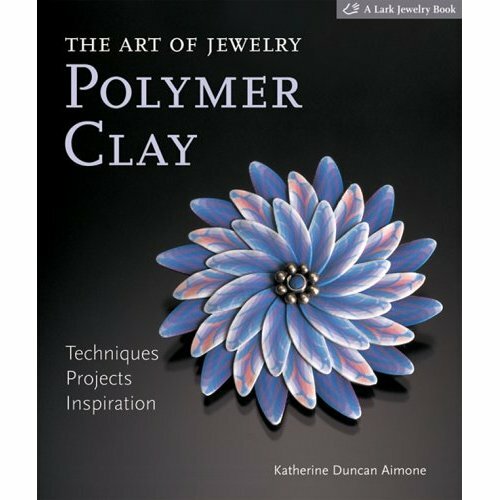 I would give this book six stars out of five and highly recommend it to advanced clayers interested in jewelry projects. On the right you can see a project I created after reading the book. 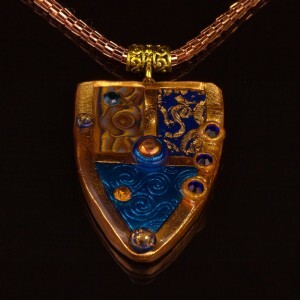 It is “Shield of Glory” pendant necklace. I plan to be posting a free tute on a Valentine’s Day pendant necklace soon, so stay tuned! 🙂 I will do it as soon as time permits.